I was in no danger of self-satisfaction. I had arrived at an understanding of all I could not do, which felt like reaching the edge of the world. Once I realized that the things I had habitually used to prop myself up (the new pair of shoes, the good piece of news, the great review, whatever) were as fleeting as a sugar rush, they lost their luster. I had spent years—my whole life!—taping myself together like so many torn bits of paper, bolstering myself up with ephemera. What was I supposed to use to hold myself together, now they were gone? Oh, what’s that you say? The idea is not to hold myself together at all? It felt as if another step, and I would free-fall. Another step, and who knew what would happen? There was no stopping, no pausing. Truly, there was no comfort. How long had I been at this? A year? Two? It was no time at all, in the greater scheme of things, and here I was. I had arrived—in the words of Thomas Merton—at an abyss of irrationality, confusion, pointlessness, and apparent chaos. This, Merton believed, was the only point at which faith was possible. But most days, I felt the chaos without the faith. I have for many years typed things that other people have written in order to have become part of me. As a kid I typed lyrics on Mom's college typewriter. For years I've typed poetry into the computer. Now it's a chapter of Dani Shapiro's Devotion today). I wanted to remember and have all those lyrics. I needed to be able to keep the poems I had begun to love. And now, more often than not and certainly in the case of the Shapiro quote, I want to take the ideas in and weave them into my DNA. Typing these things, copying them out like some medieval scribe imprints them on me. I am made a better person, someone with more ideas who yearns beyond what I even thought possible. In the back of my notebook, working from the last page forward until I meet up with the writing I have done starting from the front and working back, are quotes from the things that I read. I've often thought I should collect all these, type them into my computer, maybe create a database. Of course that would be too much work. It would take away from reading more books, writing more words, being a person in the world. Still, the idea lingers until I remember that I have already copied them down. It is enough. Perhaps I'll return to them but probably not. 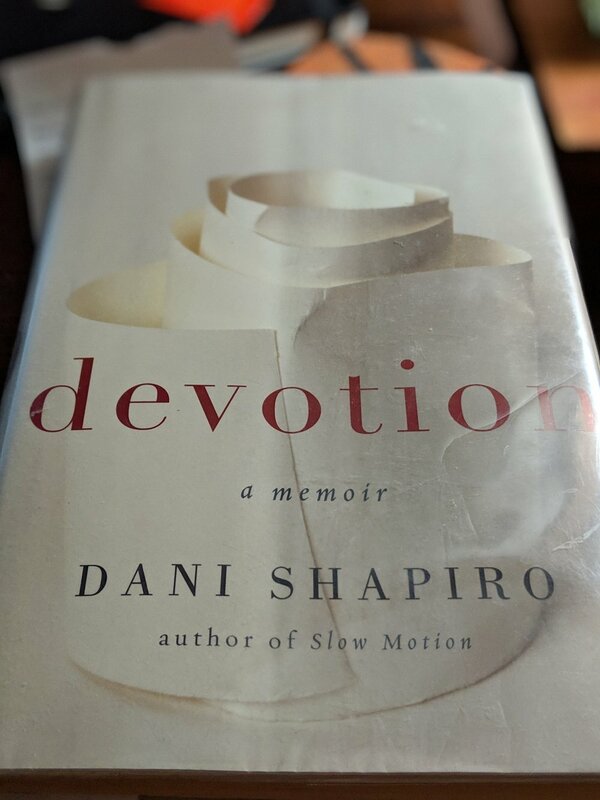 Devotion is a book to which I can imagine returning, but I probably won't because I haven't yet read everything she has written. Inside the copy I borrowed from the library was a check out receipt from another patron who on the first of May last year took out three of Shapiro's books. I imagine that person and the image comes to mind easily, looking very much like me or however a person looks when they are seeking something and, holding three books in their hand, feels that they are well on their way, that some kind of understanding is inside those pages. They rush home, find a quiet place, and open to page one. I can't wait to read Inheritance. I have so much to learn.